ARLINGTON, Va. – They are safety nets and superheroes, last resorts before disaster strikes. 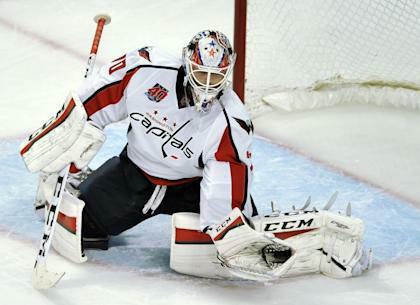 That how Mitch Korn, the veteran goaltending coach now plying his trade with the Washington Capitals, sees the mission of a professional netminder. Korn has been in the insurance game for roughly 35 years at every level. His most heralded achievement was helping Dominik Hasek become the Dominator, winning four Vezina trophies while Korn was the Buffalo Sabres’ goalie coach from 1991-98. Then he went to Nashville under the franchise’s inaugural coach Barry Trotz, and became foreman of one of the NHL’s most consistent goalie factories: Mike Dunham then Tomas Vokoun then Chris Mason then Pekka Rinne, with players like Dan Ellis and Anders Lindback playing above their heads on his watch. “There’s no secret. We’ve had some good success. A lot of names you’ve heard of, a lot of names you haven’t heard of, yet we try to build them the same way. Some guys get it, and some guys don’t. At the end of the day, goalies make themselves goalies,” he said. So does Braden Holtby get it? That’s been one of the most pressing questions about the Capitals this season. For the most part, he’s been – statistically speaking - one of the worst starting goalies in the NHL through two months. Then he uncorks a gem like the one he had against the Chicago Blackhawks over the weekend, with 38 saves on 40 shots, and you’re reminded why the Capitals fancy him as a franchise goalie. The task for Korn upon his arrival in Washington wasn’t just to elevate Holtby’s game, but to help him reclaim it. His effectiveness and confidence took a nosedive under former goalie coach Olaf Kolzig, who repositioned him inside the net, and former head coach Adam Oates, whose defensive philosophy was to hang Holtby out to dry like wet linens on a clothesline. Holtby's poor save percentage is not warranted by the shots - quantity or quality - the Caps are yielding. His problems between the pipes may be between the ears - it seems reasonable to expect it might be difficult for a goalie to adjust to a(nother) new coach and system. The good news is that the Caps' defense appears to truly be solid; the bad news is that the goaltending has been abysmal. In terms of long-term success, this actually bodes well for the team, as it seems far more likely that the goaltending will get better than that the defense will get worse. “It’s well-documented what they wanted him to do last year. It’s not in his DNA. I get that,” said Korn at the start of the season. How does one rebuild a goalie that’s lacking confidence? ‘It’s muscle memory. We’re breaking down skills into little pieces for him,” he said. “It’s not to say the guys who came before us did anything wrong, but hockey evolves. He needed to change. If this sounds as cerebral as it does athletic, that’s because grey matter is at the core of Korn’s philosophy. Not only in how goalies evaluate their own performances, but how they react in the moment. “Skills a big part of it. As hard as you try to improve processing, some guys can’t do it fast enough to play in the National Hockey League,” he said. So what makes for a great goalie? This is especially true when you start talking goaltending philosophy with him. He’s more Mr. Miyagi than Kobra Kai: Korn isn’t a “my kung-fu is the best” type, rigidly attempting to force goalies to conform to his desired style; rather, he searches for distinct talents in netminders and accentuates them. “You don’t want to coach out of a guy what he does special,” he said. But wizard that he is, Korn carries a sage wisdom into every coaching situation. Some of that experience, but a good portion of it is innovation. For example, Korn isn’t leaving hockey analytics to the guys shooting the pucks. Korn keeps his own stats, ones that he believes are valuable to the evaluation of a goalie’s effectiveness. Mostly because he doesn’t trust the ones generally accepted as a way to judge a goalie. “If Steven Stamkos shoots the puck from there, and Tie Domi shoots from the same spot, doesn’t that make a difference?” he asked. He won’t reveal the specifics on what he measures, but the broad strokes are interesting. “I don’t evaluate you on the saves you make, but on the goals you give up,” he said. “If we can eliminate what some would refer to as ‘bad goals,’ what else do you want from him? But in the end, the foundation for everything comes down the body and the brain working in concert. “I break the game down into three parts: The physical skills. Flexibility, size, which you can’t control; it’s mental skills. Finding pucks in traffic, connecting dots, reading patterns. Hockey is a game of patterns – the faster you identify the patterns, the better you’ll play,” he said. Don’t confuse aggression with emotion. Korn lauds the former, but the latter can be a goalie’s undoing. But there is no catharsis for goalies. Like any goalie will tell you, their entire existence is an unending series of events in which they get too much blame but not enough credit. And you can only fit the body you’re given, or work with the talents you’re blessed with. What Mitch Korn has done, and is continuing to try and do, is evaluate and accentuate them. “My job is to take what you do best, and have you continue to do it best. And what you may not do well, I’ll help you either fix it or hide it,” he said. And Korn’s one hell of an interior designer.